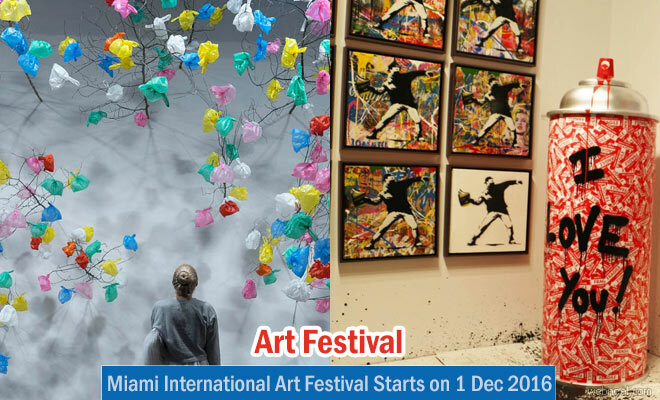 Miami is all getting ready for it's annual art festival which goes by the name 'Art Basel', and it is set to happen from December 1st - 4th, 2016. During this art festival 269 leading galleries from Africa, Europe, Latin America, Asia, and North America will be exhibiting the professional and amateur artists contemporary and modern artworks. Paintings, sculptures, installations, photographs, films, and edition works of the highest quality are on display in the main exhibition hall. Ambitious large‐scale artworks, films and performances become part of the city's outdoor landscape at nearby Collins Park and SoundScape Park. Reduced tickets: Reduced day ticket for students and seniors (valid one day, either Dec 1, 2, 3 or 4): USD 34. Students are individuals attending a college or university. Seniors are individuals ages 62 and up. Please fill out the application form here. Group tickets: Groups of 10 people or more: USD 34 per person (valid one day, either Dec 1, 2, 3 or 4). Please fill out the application form here. School group tickets: School groups (grades K–12 accompanied by max. 3 teachers and/or chaperones per group): USD 17 per person. Groups are limited to 30 children and to 3 teachers and/or chaperones per group. College and university students need to purchase the reduced day ticket at USD 34 per person. Tickets can be purchased at box offices outside of halls C and D on the west side of the Miami Beach Convention Center building beginning December 1, 2016.